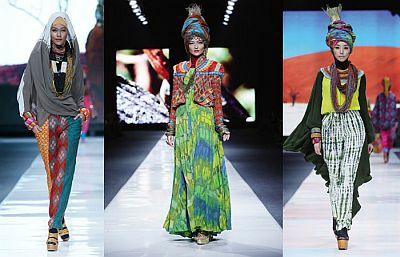 JAKARTA, INDONESIA, Jul, 25 2013 - (ACN Newswire) - Jakarta Fashion Week, one of the biggest fashion weeks in Southeast Asia, will once again raise up the best creations of Indonesian designers to world in 2013. JFW 2014 will present the latest collections of local and foreign designers which will inspire next year's fashion trends. JFW 2014 will be held on October 19-25 in Senayan City, the world-class shopping mall in Jakarta. Muslim wear will feature as one of the categories on the stage of Jakarta Fashion Week 2014. Muslim fashion has presented a foundational contribution in advancing the Indonesian fashion industry. By 2015, Indonesia is expected to be the center of Muslim wear in Asia, and by 2025 the center of Muslim fashion in the world. The government also esteems Muslim fashion, with Indonesia Muslim wear exports anticipated reaching 7 percent in 2025. Jakarta Fashion Week, which one of the main references of global Muslim clothing, continues increasing the quality of its Muslim designers to becoming recognized in international markets. Jakarta Fashion Week believes firmly that expanding Muslim designers' capacities is one of the essential keys. For that reason, started since last year JFW has been conducting Indonesia Fashion Forward, a program which focuses on developing young designers' capacities. Last year, Dian Pelangi was the young talented designer who represents Muslim wear category. In the growth of Muslim wear industry, Indonesia Fashion Forward 2013 involving two labels of Muslim wears, Nur Zahra and Jenahara. "The strength of Dian Pelangi, Nur Zahra, and Jenahara are their designs' character is not only favored by women who wear hijab, but also by fashionistas who do not wear hijab daily. With this strategy, their works could be absorbed by the consumers of western countries and compete with other clothing categories," says Diaz Parzada, Creative Director of Jakarta Fashion Week. "According to specialists from the Centre for Fashion Enterprise in London, who are the advisors of Indonesia Fashion Forward program, the designs of Dian Pelangi with combinations of bright colors meet the taste of consumer in Europe and Middle East. The designs of Jenahara fit perfectly with Western Europe and America consumers with their minimalist design and colors in monochromatic palette. Nur Zahra's designs, using organic materials which show natural colors, wholly match Southern European and Japanese consumers." The creations of Dian Pelangi, Nur Zahra, and Jenahara depicting next year's Muslim Fashion trends will be featured in Jakarta Fashion Week 2014. Apart from developing the Indonesian Fashion Forward 2013 program, JFW 2014 will hold a Buyers' Room starting on October 16, 2013 in Senayan City. Buyers' Room cooperates with Indonesia Trade Expo which is held by the Indonesian Ministry of Trade on October 16-20, at the Jakarta International Expo, in Kemayoran, Jakarta. With 'Exhibiting Trade with Remarkable Indonesia' as the theme, more than 10,000 foreign buyers and 25,000 domestic buyers are expected to attend this event. Buyers from fashion district are also expected to have a face to face appointment with Indonesian designers in Buyers' Room JFW 2014. Last year's Buyers' Room program successfully brought the designs of Indonesian designers to international market. One of them is the collection of Major Minor that attracts Harvey Nichols, the buyer from the UK. Today, Major Minor's products are available in the European market through Harvey Nichols. JFW 2014 is supported by the Indonesian Ministry of Trade and the Ministry of Tourism and Creative Economy, along with the partners who have great commitment in promoting the fashion industry, such as PT Mazda Motor Indonesia, The Body Shop Indonesia, Bellini, the British Council, PT Matahari Department Store Tbk and L'Oreal Indonesia. Jakarta Fashion Week 2014 is the main fashion week in indonesia which directs Indonesia's fashion and demonstrate talents and creativities of Indonesia fashion industry. JFW 2014 is held by Azura Activation, a part of Femina Group. For further information, visit www.jakartafashionweek.co.id, or social media site www.facebook.com/jakartafashionweek and follow www.twitter.com/JKTfashion. Femina Group is the media company of lifestyle and modern women which oversees Femina, Gadis, Ayahbunda, Pesona, Parenting, Reader's Digest Indonesia, Cita Cinta, CLEO, Men's Health Indonesia, BestLife, Grazia Indonesia, Dewi, Estetica, Women's Health, 94,7 UFM Jakarta & Bandung and Azura Activation. As one of the biggest and qualified media group through magazines, events, and contests that is held annually, Femina Group is the vital catalyst in developing and promoting fashion in Indonesia since 1971. Femina Group always holds on the commitment to be the leader in promoting Indonesia's fashion, through editorial in magazines and also in the event of the talented designer development program through JFW and LPM (fashion designers contest). For further information, visit www.feminagroup.com.